Car transport services make moving a vehicle from one location to another fast and easy. Doing it yourself can an exercise in logistics as well as economics. Frequently, it is impossible to transport a car when the only person available to drive is driving the truck with their belongings. Driving a vehicle from coast to coast involves unnecessary wear-and-tear on the car, not to mention the expense of fuel. It may be that more than one car needs to be transported. The solution is to select one of the car transport services which meet or exceed the bond and license requirements, yet are affordable. For those who own “typical” cars – normal, everyday autos for commuting to and from work – an open auto transport method is probably best. This is less expensive than using an enclosed truck, while still offering the protection of professional loading and truck transport. Open truck transports are the ones most frequently seen on the highway. If you own a classic or luxury car, then the first question you ask any auto transport company should be whether they have an enclosed transport available for your car’s journey. Enclosed transport – which stores the entire car in a truck – shields it from the elements and from incidental damage caused by sticks or rocks. It can protect your car’s paint job and maintain its value. Individuals who own luxury and classic cars should know that this method of transport is slightly more expensive, but well worth the peace of mind which accompanies it. 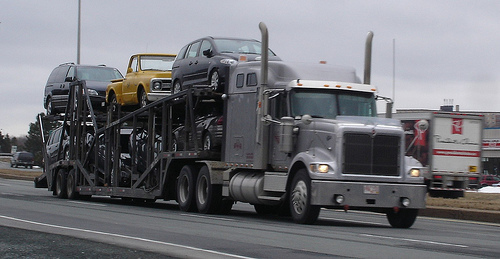 This method of auto transport relies on a truck with a flat bed, which the car is secured to during transport. It is not recommended for classic cars or luxury cars, as it leaves the car exposed to the elements. This is a great way to transport older cars and less expensive cars, which are still fully covered by the auto shipping company’s insurance. A dolly is a small piece of equipment which attaches to another vehicle, enabling the driver of a smaller car to tow a second vehicle behind them. Dollies can typically be rented from auto shipping companies based on the number of days you wish to use them, unlike car shipping costs, which vary depending on weight and distance traveled. However, using a dolly attached to your own car has different insurance implications than using a professional auto transport service. When making the decision to use this method of transport, you should check with your insurance company to make sure your car will still be covered, and that you don’t need to purchase additional riders to your insurance. Train transport is environmentally friendly and cost effective, but has very limited availability. So, unless you live near a train line which allows train transport of cars, it is not a method which can be frequently taken advantage of. If you are shipping your car or other vehicle overseas, you will need to look at options for transport, including sea transport by ship. International car shipping can add considerable time and expense to your car’s journey, but, as certain foreign cars are not available in the US (or you might want to take your American car with you if you are moving to another country), it is an important option to have. For short moves, it is practical to retain the services of a domestic car shipping company. This can be as simple as retaining a licensed and bonded driver to pick up the car and deliver it, door to door. Some roadside assistance and car towing companies have flatbed trucks, which deliver cars as an adjunct to their usual road service business. They frequently have a number of well-trained and legally qualified personal experienced in car transport services. Most car dealerships have contacts with a number of preferred services which they already have an established relationship. It’s not complicated to figure out that a business engaged in car sales would choose the most cost-effective and reputable car transport services for their needs. Many are willing to refer a potential client, as the dealer would receive some sort of consideration down the road for the referral. The internet is, as usual, an excellent resource for researching both services and cost comparisons between several services. Some are portal sites, which are not actively engaged in the business of car transport, but instead pre-qualify the car shipping services that supply quotes to ensure compliance with the bonding, certification and licensing requirements for local, interstate or international car transport. As with any reference, it is incumbent on the customer to exercise due diligence and satisfy themselves regarding any details or complications that apply specifically to transporting their car, or the car transport services in general. It is possible that the most affordable solution is the first one found, however, it is unlikely. The best way to find the car transport service that best suits your needs is to compare your chosen car transport service with the car transport services that offer identical – or very similar – qualifications and services that satisfy the customer’s unique list of requirements and priorities. If a very expensive car is being transported, will it be protected with a weatherproof cover that does not have any potential of damaging the exterior finish? Is more than one car being transported? A quantity discount may be applicable. Will the car be delivered expeditiously? Is door-to-door pickup and delivery needed, or will there be a lag time when the car may have to be temporarily stored for a will-call pick-up? Is any special preparation required by the customer or will the car transport service handle all the preparations? Will they provide a binding cost estimate and contract in writing before the car is picked up? There is a point of diminishing returns. Shaving a penny per mile and forgoing some desirable feature may seem more affordable, however, it may simply be false-savings if individually listed add-on fees for tolls or fuel surcharges are not included. Will the car be attended or secured during the entire auto transport process? The lowest price per mile does not necessarily indicate the most affordable of the large number of car transport services. To get started comparing car transport services, fill out the short form at the top of the page.